"Run, the Devil is coming!" As the stench and horror of World War I trench warfare increase, both sides seek the breakthrough weapon; immense barrages, air power, flamethrowers, even poison gas. All are tried and found wanting. At last the most awesome machine of all is made ready - the Landship! 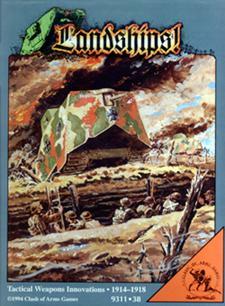 Landships! Tactical Weapons Innovations 1914-1918 covers the Great War at its lowest level. The 420 playing pieces represent infantry platoons and cavalry squadrons, or a single tank or gun. Each turn is around 5 minutes and a hex on the eight geomorphic map sections is about 100 meters. Easy to play rules with over 20 scenarios get you started right away. Trace the story of combat during the war; from the simple slaughters of 1914 to the sophisticated combined arms offensives of 1918. Only boxless version now available.